This is another beautiful and rustic music box handmade by Holzspielwarenmacher Gunther in Seiffen, Germany which has been making wood creations since 1914. Currently the design and handwork is done by Tino Gunther. This music box features a skier, boy sledding and a snowman and is meant to capture a winter scene. 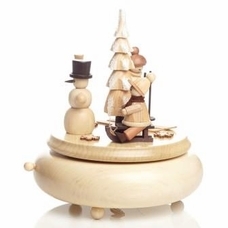 The music works inside plays "Schneeflockchen Weissrockchen" and will sure bring some soul to your winter evenings. Approximately 7 inches tall and 6 inches wide.